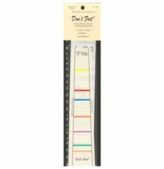 Below is a sampling of the violin fingerboard tape products we carry. They can be used to safely mark the notes on the fingerboard of a violin. Click on the violin fingerboard tape products for larger images and a full description.